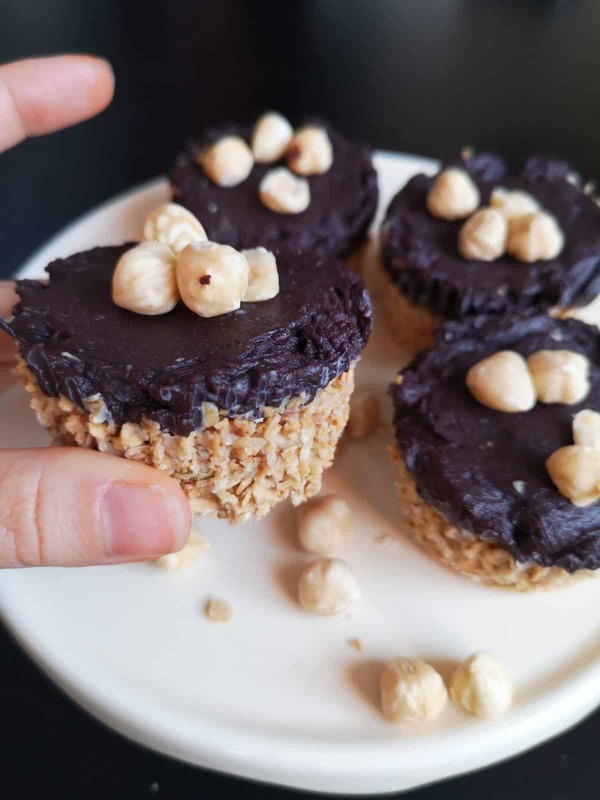 This is a heavenly combination of creamy and slightly salty hazelnut butter on a based of crunchy granola and topped with smooth dark chocolate ganache. These are the perfect Sunday afternoon treat, or could easily be made in a heart shape mold for that special Valentine! 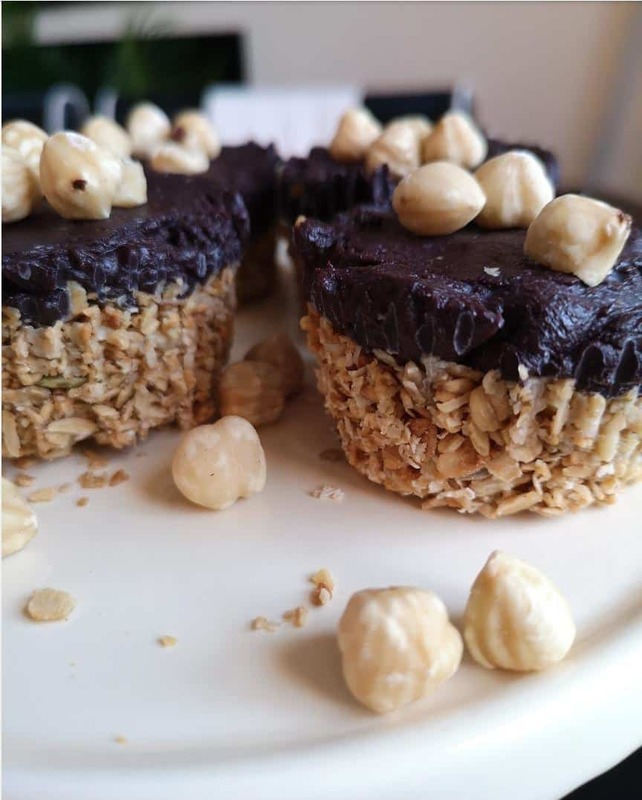 Entirely raw, dairy free, gluten free and vegan these can be made for anyone and everyone. I always loved Reese’s Peanut Butter cups growing up as a child, so this has been on my radar to try and make for quite some time. I actually employed the help of my eleven-year-old sibling for this one. Getting kids to understand the benefits of certain ingredients or cooking things from scratch isn’t always an easy task when we have phones, laptops and TVs surrounding us. This recipe requires no baking and only uses a little heat to melt the oils and chocolate so can be a great one to get kids involved in. Plus, child or adult, who doesn’t love the idea of a Nutella Reese’s cup – right? Line with cases or grease very well with coconut oil, a 12 cup muffin tin. In a blender, pulse the granola, melted coconut oil and chopped hazelnuts until well mixed and a little sticky. If the mixture is still dry add more coconut oil and a splash of warm water. If you don’t have a blender, you can always put the granola in a ziplock or tightly closed bag and crush the granola using a rolling pin – bash and smash until crushed. When fully combined, make a base in each of the cupcake/muffin molds that should be 2 inches thick in the middle and thicker around the outside – leaving enough room for the hazelnut butter filling! Next, take a tablespoon and place a large dollop of the nut butter in the middle of the filled muffin bottom. Sprinkle with a tiny pinch of the sea salt. Next in a thick bottom pan on low heat mix the coconut oil and dark chocolate to make the ganache. Once these are thoroughly melted and combined, take a spoon and pour over the top of each hazelnut cup until fully covered. Pop the cups in the fridge for at least two hours. When they are ready they should be hard and the tops should be a little shiny. Enjoy cold or leave them at room temp for 20 minutes for a softer and gooey chocolate & hazelnut cup!